The Lake Geneva Region association promotes the exchange between the public and private real estate sector in the French and Swiss areas around Lake Geneva. The Lake Geneva Region association is participating in the MIPIM property market fair each year. The 2018 event took place from March 13th until March 16th in Cannes, France. We had the pleasure of developing the app for LGR. The app contains all the information about the event, the best way to offer updated information to the attendees. LinkedIn group. Link to the LGR LinkedIn page. Participants. List of participants with their organization, job title and email. Round tables / Visits MIPIM / Swiss Event. Additional information for some of the programme items. Speakers. List of speakers with relevant information to their organization, job title, email and their correspondent sessions. Documents. Pdf files related to the event. Survey. The customer used this module to get the feedback from the participants about their stand and the use of the app. Notifications. Push alerts and notifications. 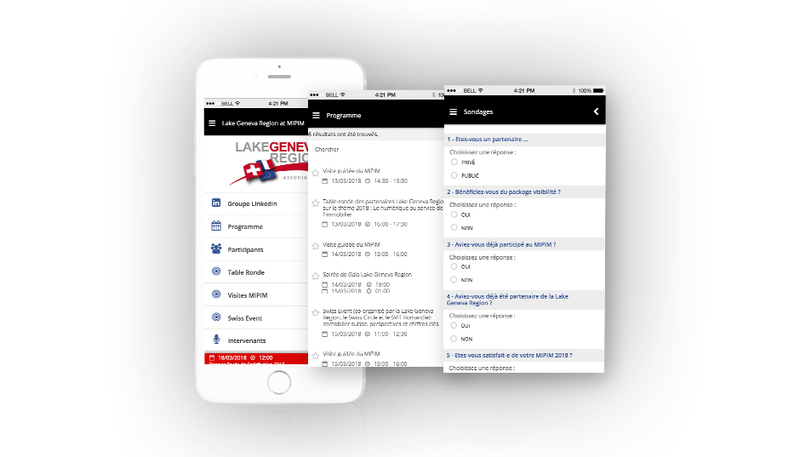 Allows the organizer to inform the participants about the upcoming programme, general info or send reminders. Contact. Form through which users can make direct comments or suggestions to the organizers. Extras. Contains app guide, login, settings, update of app content and more.